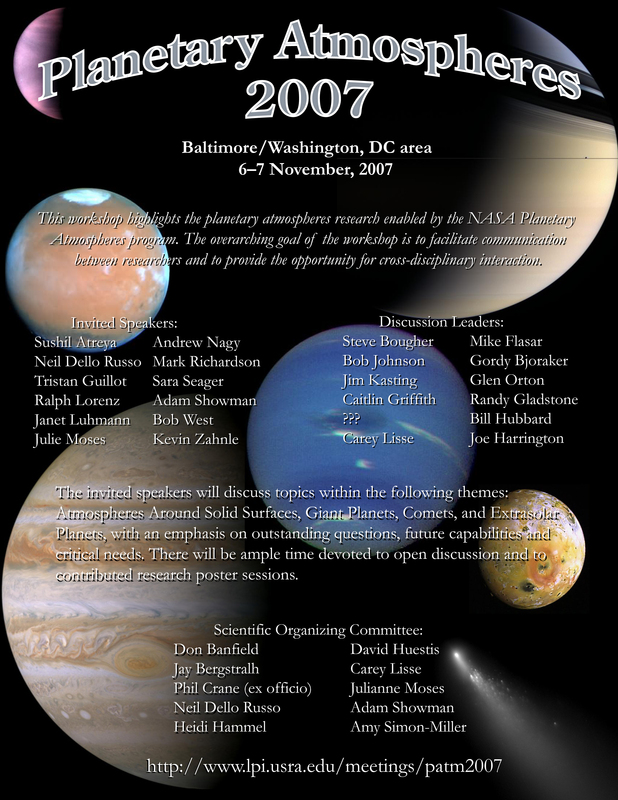 The Workshop on Planetary Atmospheres will be held November 67, 2007, at the Greenbelt Marriott Hotel, 6400 Ivy Lane, Greenbelt, Maryland 20770. Important travel information is included in the NASA Travel and Workshop Information document. Please take the time to read this information carefully. This professional workshop will highlight scientific research that falls under the traditional purview of the NASA Planetary Atmospheres Program. The main goals of the workshop are to facilitate communication between atmospheres researchers; to provide opportunity for cross-discipline interaction; to identify particular fields of interest in planetary atmospheres research for the next decade; and to stimulate theoretical, laboratory, and data-gathering activities in those critical fields. The talks should be broad overviews that focus on current outstanding questions in the field and should include a discussion of critical future laboratory work, models, and data needed to address those questions. Moderators have been assigned to help lead discussions following the talks. Posters should be no larger than 42 inches by 42 inches. Posters will remain up both days of the meeting and should be removed no later than 7:00 p.m. on Wednesday, November 7. There is no registration fee for this workshop, but those planning to attend need to register in advance of the meeting. To assist the organizers in planning purposes, please submit the electronic registration form no later than October 12, 2007. A block of sleeping rooms is currently on hold for workshop participants at the Greenbelt Marriott Hotel. The hotel is located at 6400 Ivy Lane, Greenbelt, MD 20770. Please contact the hotel directly at 1-800-228-9290 to make a reservation within the group block no later than Friday, October 5, 2007. When you call, ask the reservations clerk to include you in the "NASA" sleeping room block in order to receive the group rate of $188.00 per night + tax. Provide the reservations clerk with your full name, credit card number, and expiration date to cover the cost of your room. Lodging for one night will automatically post to your credit card account as a deposit to secure your reservation. Cancellations must be made 72 hours in advance prior to your arrival date to be fully refunded by the hotel for your deposit. All reservations must be accompanied by a first night room deposit and guaranteed with a major credit card. The hotel will not hold any reservation unless secured by the prescribed method. For participants attending only the PATM workshop, check in is on Monday, November 5, 4:00 p.m.; check-out is on Wednesday, November 7, at 12:00 noon. Those attending VEXAG or OPAG or both should check with the information for those meetings. Reservations by attendees must be received by the hotel on or before Friday, October 5, 2007. After this date, the hotel will release all unreserved rooms for general sale to the public at market rates, and determine whether or not it can accept reservations based on a space-and-rate available basis at the group rate. For your convenience and to ensure that your office and family can contact you, the hotel's phone number is (301) 441-3700. The guest fax number is (301) 441-3995. Baltimore Washington International Airport (BWI): The Baltimore Washington International airport is most convenient to the workshop site, as it is located about 21 miles from the Greenbelt Marriott. The cost of a taxi is approximately $25.00 one way; shuttle service is $20.00 for the first person/$10.00 per additional passenger. Travel time is about 30 minutes by car in low-congestion traffic. Ronald Reagan Washington National Airport (DCA): Located about 22 miles from the Greenbelt Marriott Hotel and generally costs $35.00$40.00 by taxi. Travel time is about 45 minutes by car in low-congestion traffic. Washington Dulles International Airport (IAD): Located about 35 miles from the hotel. Offers more nonstop flights from west coast locations. Transportation is available via Washington Flyer cab service (costs $50.00$60.00); shuttle service is about $25.00 for the first passenger/$10.00 per additional passenger. Travel time is approximately 45 minutes to 1 hour by car in low-congestion traffic. The Metro is highly regarded by local residents as clean and safe as well as user friendly to visitors. From Ronald Reagan Washington National Airport, take the Green line in the direction of "Greenbelt." Exit the Metro at the "Greenbelt" metro station to get to the hotel. To better assist you in using the subway system; refer to the Washington Metropolitan Area Transit Authority website at http://www.wmata.com/metrorail/systemmap.cfm. The hotel offers complimentary shuttle bus service within a three-mile radius of the hotel. You may schedule a pick-up from the Greenbelt Metro station by contacting the front desk at (301) 441-3700. Please wait for the driver under the signage marked "Kiss-N-Ride" located near the parking lot and taxi cab stand. The hotel shuttle operates hourly from 7:00 a.m. to 9:00 p.m. daily. A meeting package for meals will be provided daily, which includes breakfast, lunch, and an afternoon refreshment break. Dinner will not be served. However, a list of local restaurant establishments will be provided at the Event Registration table. Refreshments and lunch will be provided to all participants; government participants, please do not seek reimbursement from your agency or institution. Travel arrangements and reimbursements for this workshop will not be covered by NRESS, but by your respective agency or institution per approval. Interested participants are encouraged to print and distribute copies of the workshop flyer.